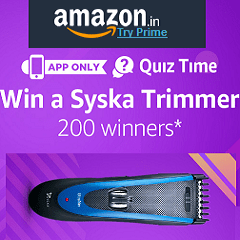 Play Amazon Syska Trimmer Quiz Contest and stand a chance to win Syska Trimmer. PRIZES: 200 Lucky winners will get a Syska Trimmer. The Prize will be delivered to the winner on or before 31st January, 2018. Sign-in to or sign-up from an account on the Amazon.in App. Once you have signed-in to the Amazon.in App, you can participate by navigating to the contest page. Answer 5 questions (given below). If you answer all questions correctly, you will be entitled for a lucky draw. A total of 200 participants will be selected as winners by lucky draw. The declared winners will get a Syska HT1309 Hair & Beard Trimmer. 1. NOT a feature of the Syska HT1309 trimmer. 2. NOT the name of a popular beard style. 3. Syska HT1309 gives 60 minutes of continuous trimming with 8 hours of charge. 4. Name of a popular mustache style.